Are the sharks circling in season eight of ABC’s Shark Tank TV show? We all know the Nielsen ratings typically play a big role in determining whether a TV show like Shark Tank is cancelled or renewed for a ninth season on ABC. Unfortunately, most people don’t live in a Nielsen Household. Because many viewers feel frustrated that their viewing habits and opinions aren’t considered, we’d like to offer you a chance to rate the season eight episodes here. 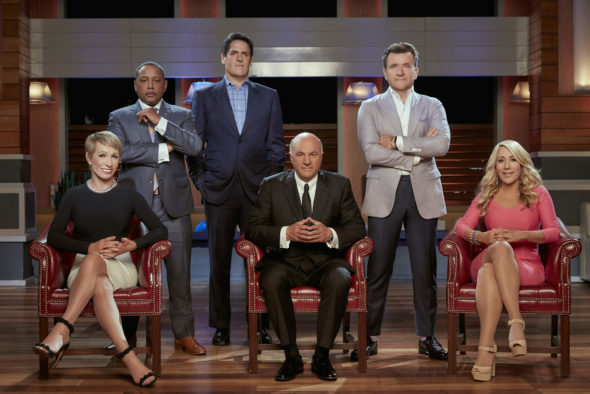 A competitive reality series airing on the ABC television network, Shark Tank features Mark Cuban, Barbara Corcoran, Lori Greiner, Robert Herjavec, Daymond John, and Kevin O’Leary. These self-made, multi-millionaire and billionaires are on a quest to invest in the best American businesses and products. These “Sharks” give competing entrepreneurs the chance to pitch their businesses, in hopes of scoring deals that could make them millionaires. What do you think? Which season eight episodes of the Shark Tank TV series do you rate as wonderful, terrible, or somewhere between? Should this ABC TV show be cancelled or renewed ? Don’t forget to vote, and share your thoughts, below. Shark Tank: ABC Show Returning on Friday Nights; Good Move or Death Slot?